These two meditations were originally taught to me by Master Hong and I have further developed them to reach deeper levels of healing for our modern stresses. 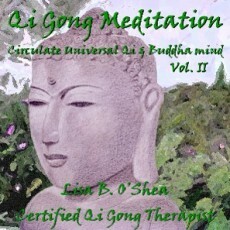 The Circulate Universal Qi Meditation uses visualization to carry us to the center of the universe, balance both sides of the body, and bring healing energy into ourselves as well as guide healing to others. The Buddha Mind Meditation brings us to a better state of balance between our physical body and our spiritual being by taking us through the process of releasing attachments to old thought patterns in order to allow us to open up to the possibilities our spirit would like to offer us. Co-produced by Lisa B. O'Shea and Georgann John. Engineered by Lisa B. O'Shea.